To date, a variety of LAMS sizes have been commercially available, with the previously largest LAMS diameters available being 15 mm and 16 mm from two different manufacturers. Recently, a LAMS with a 20-mm lumen was released for a limited commercial launch. This device, known commercially as the Axios stent (Boston Scientific, Natick, MA, USA), is supplied preloaded on an electrocautery-enhanced catheter which is used to both access the PFC through EUS guidance and to deploy the stent. This is currently the largest diameter LAMS available. We performed a retrospective multicenter, pilot study of the new 20-mm Axios stent to evaluate it with regard to technical success, clinical success, and adverse events. Studies with experience using the 20-mm Axios stent were contacted, and an Excel spreadsheet (Microsoft, Redmond, WA, USA) containing 32 parameters for each use of the device in question was sent to each center. Patients were excluded from the study if they were <18 years of age, pregnant, or members of vulnerable populations. Institutional Review Board approval was obtained for this study. Seven patients (3 males and 4 females) underwent placement of a single 20-mm Axios stent for drainage of a PFC [Figure 1]. Five patients were Caucasian and two were African-American. The mean patient age was 45 years (range: 21–67 years). The etiology of pancreatitis in these patients was gallstones in 2 patients, alcohol in 4 patients, and hypertriglyceridemia in 1 patient. PFCs were located in the body and tail of the pancreas in 2/7 patients and in the head, body, and tail in 5 patients. This latter group was composed of patients in whom the PFC was felt to involve essentially the entire pancreas (or close to it). The mean long-axis measurement of the PFC was 132 mm. The mean short-axis measurement of the PFC was 73 mm. All PFCs to undergo drainage in this study were felt to contain some degree of solid debris when imaged through EUS. The mean percentage of solid debris in the PFCs was 67% (range: 30%–80% solid debris). Two patients underwent a concomitant ERCP at the time of the placement of the Axios stent. In one patient, a 5-Fr pancreatic duct stent was placed to assist in decompression of the pancreas. In one patient, a biliary stent was placed to treat simultaneous biliary obstruction from extrinsic compression of the common bile duct through the PFC. All 7/7 (100%) LAMS placements were technically successful. All LAMSs were placed in a transgastric manner. There were no transduodenal placements in this study. Postdeployment dilation of the LAMS was performed in 6/7 patients (86%). A double-pigtail plastic stent was placed through the LAMS after deployment in 3/7 patients (43%). No patients (0/7) underwent placement of a nasocystic tube after deployment of the LAMS. Two patients also underwent placement of a percutaneous drain for separate fluid collections not amenable to transmural drainage. Direct endoscopic necrosectomy (DEN) was performed in 6/7 patients (86%). In 1 patient, the PFC was able to be completely treated without the need for DEN. The mean number of DEN sessions per patient was 2 (range: 1–6). The mean indwell time for the LAMS was 28.9 days. Clinical success was achieved in 7/7 patients (100%). One patient died 28 days after LAMS placement of an unrelated bowel perforation. This patient was not counted as a clinical failure as several computed tomography scans showed that this patient's PFC had largely resolved and this was scheduled to have her LAMS removed in the coming days – the bowel perforation resulted in this patient's demise before the LAMS could be removed. No patients experienced stent occlusion or migration. There were no bleeding events. This study represents the first published multicenter data regarding the use of a new 20-mm diameter LAMS for PFC drainage. LAMSs are now widely employed for the drainage of PFCs.,,,,,, In the past, LAMSs have been available in sizes ranging from 2 to 16 mm wide, with a 15-mm LAMS being widely employed throughout Europe and the United States. While the difference in diameter of a 20-mm stent to a 15-mm stent may seem small, the increase in stent diameter translates to a significant increase in cross-sectional area. A 15-mm wide LAMS has a cross-sectional area (for drainage, necrosectomy, etc.) of 176.71 mm2. In contrast, a 20-mm wide LAMS has a cross-sectional area of 314.16 mm2. This difference translates to 77.7% greater cross-sectional area. It is this reason that large diameter LAMSs are of such great clinical interest, both for on-label and off-label LAMS uses. It is hoped that a larger diameter LAMS would allow PFCs to be drained and clinically resolve faster and would facilitate endoscopic necrosectomy procedures as well. This pilot study shows the initial evidence of efficacy and safety of a 20-mm LAMS for EUS-guided transluminal drainage of PFCs. The mean percentage of solid debris in the PFCs in this study was 67% with approximately all of the PFCs in this study having ≥30% solid debris within their lumen, suggesting that the patients in this study truly had WON and not just PP, further arguing for the safety and efficacy of a 20-mm LAMS. The technical and clinical success rates for resolving PFCs in this study were both 100%. These are superior to other published studies and meta-analysis of LAMS use for PFCs.,,,,, These data, while robust, are likely secondary to the small number of patients in the study given its pilot nature, and it is assumed that larger studies will show that these numbers will decrease with additional experience. While we are not saying that a 20-mm LAMS is safer than smaller diameter LAMS, our data suggest that these devices may be no more dangerous to use than smaller diameter LAMS. Overall, this pilot study suggests that a 20-mm LAMS is effective for treating PFCs including WON. Larger studies will be needed to determine the ideal size for a LAMS going forward to achieve maximal clinical benefit with minimal patient risk. Itoi T, Binmoeller KF, Shah J, et al. Clinical evaluation of a novel lumen-apposing metal stent for endosonography-guided pancreatic pseudocyst and gallbladder drainage (with videos). Gastrointest Endosc 2012;75:870-6. Siddiqui AA, Adler DG, Nieto J, et al. 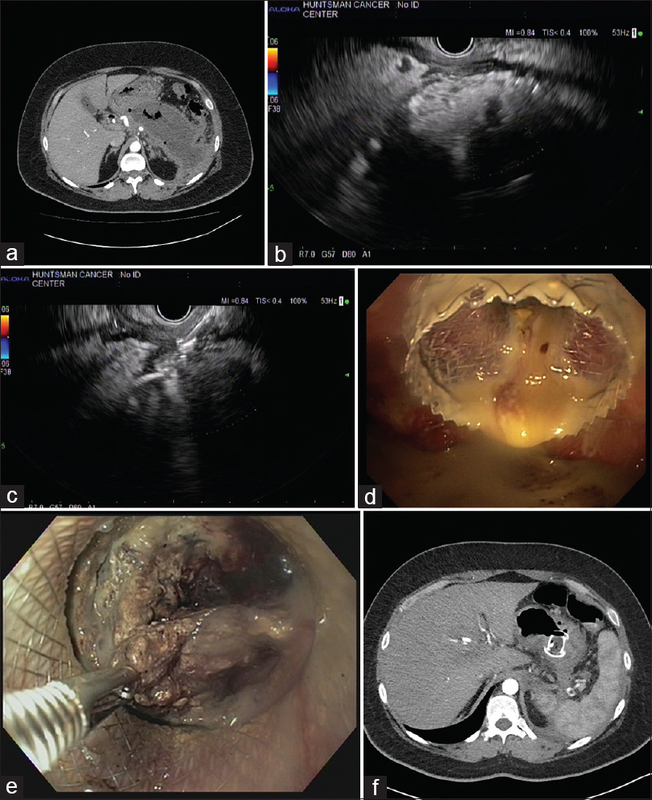 EUS-guided drainage of peripancreatic fluid collections and necrosis by using a novel lumen-apposing stent: A large retrospective, multicenter U.S. Experience (with videos). Gastrointest Endosc 2016;83:699-707. Sharaiha RZ, Tyberg A, Khashab MA, et al. Endoscopic therapy with lumen-apposing metal stents is safe and effective for patients with pancreatic walled-off necrosis. Clin Gastroenterol Hepatol 2016;14:1797-803. Walter D, Will U, Sanchez-Yague A, et al. Anovel lumen-apposing metal stent for endoscopic ultrasound-guided drainage of pancreatic fluid collections: A prospective cohort study. Endoscopy 2015;47:63-7. Bapaye A, Itoi T, Kongkam P, et al. New fully covered large-bore wide-flare removable metal stent for drainage of pancreatic fluid collections: Results of a multicenter study. Dig Endosc 2015;27:499-504. Lang GD, Fritz C, Bhat T, et al. EUS-guided drainage of peripancreatic fluid collections with lumen-apposing metal stents and plastic double-pigtail stents: Comparison of efficacy and adverse event rates. Gastrointest Endosc 2018;87:150-7. Han D, Inamdar S, Lee CW, et al. Lumen apposing metal stents (LAMSs) for drainage of pancreatic and gallbladder collections: A meta-analysis. J Clin Gastroenterol 2018;52:835-44. Tarantino I, Ligresti D, Tuzzolino F, et al. Clinical impact of EUS treatment of walled-off pancreatic necrosis with dedicated devices. Endosc Int Open 2017;5:E784-91. Bang JY, Hasan MK, Navaneethan U, et al. Lumen-apposing metal stents for drainage of pancreatic fluid collections: When and for whom? Dig Endosc 2017;29:83-90. Rinninella E, Kunda R, Dollhopf M, et al. EUS-guided drainage of pancreatic fluid collections using a novel lumen-apposing metal stent on an electrocautery-enhanced delivery system: A large retrospective study (with video). Gastrointest Endosc 2015;82:1039-46.